cooked portobella mushroom dish . . . Trader Joe’s is a great local store to pick up things you can’t get elsewhere, like Kerrygold Irish butter made from grass-fed cow’s milk. A NYTimes food tasting survey led by Melissa Clark a few months ago pronounced another butter as the “best” butter around. It started with a “P” but I can’t remember the name of it now. I made a special trip to Whole Foods to buy some to try it out but wasn’t impressed. My daughter, M., told me about Kerrygold butter while we were out in Seattle and it was the best butter I ever tasted, melted and eaten with chunks of Dungeness crab. In contrast, Kate’s Butter, a locally made butter that I’ve been using, has very little flavor and a wax-like texture compared to Kerrygold’s buttery, creamy taste. While I was at Trader Joe’s this morning, I saw some beautiful large portobella mushrooms for $2.99 that I thought I’d cook up for dinner tonight although I wasn’t sure what to do yet. At Barnes and Noble on the way home, I saw a photo of large mushrooms stuffed with spinach and breadcrumbs in a European cookery magazine. Perfect for tonight because I have some tired baby spinach I’ve used for smoothies and a heel of sourdough bread in the fridge that might make a tasty stuffing for the mushrooms. First, I cleaned the huge mushrooms with a paper towel and browned the flat end of the mushrooms in butter, placing them in a large copper au gratin pan. 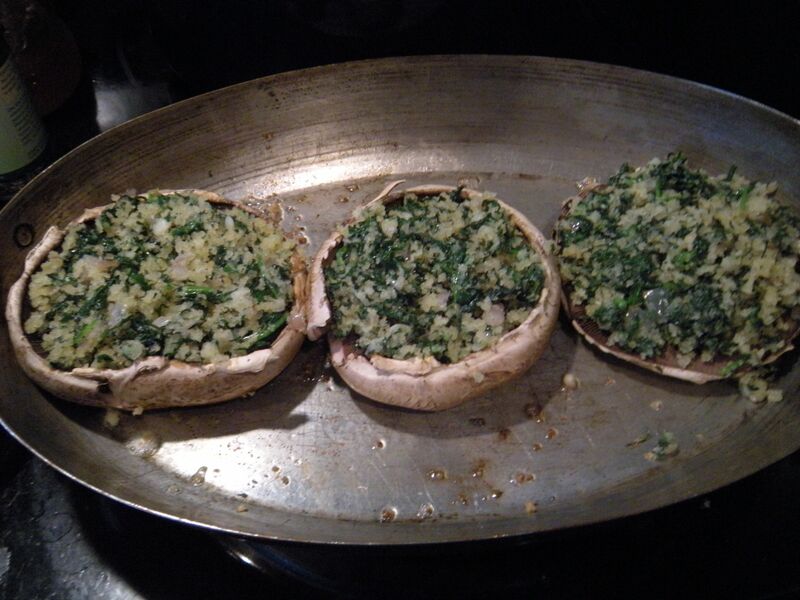 This initial browning step is important to give the thick mushrooms a head start on softening; otherwise, it takes too long for them to cook through without overbaking the spinach/crumb filling. 2. Crushed a large clove of garlic into little bits, browned it in some butter and dried parsley. 3. Toasted a third of a leftover loaf of sourdough bread. Put the toasted slices in a VItamix and crumbled it into smooth breadcrumbs. 4. Added half of the fresh breadcrumbs into browning garlic and parsley, added a sprinkle of Lawry’s garlic salt and coarse pepper, stirring the tender garlicky breadcrumb mixture and then let it cool. 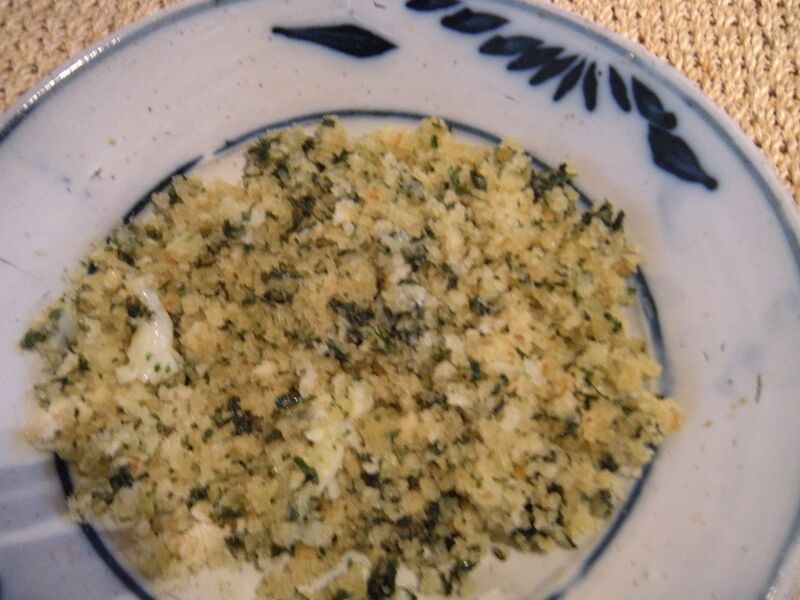 fresh breadcrumbs with garlic and parsley. . .
5. Melted another dab of butter, added chopped shallot and two handfuls of baby spinach; stirring until it quickly wilted; turned the warm spinach onto a board and chopped it finely with a cleaver. 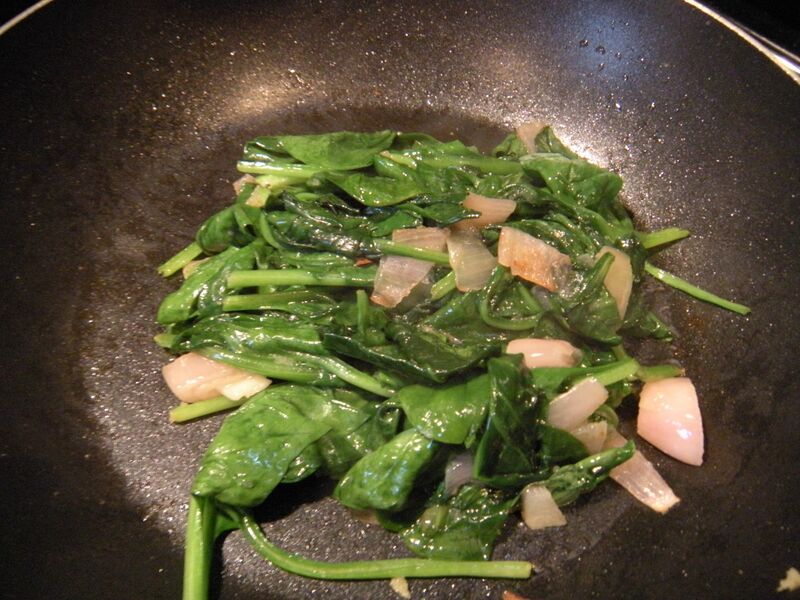 fresh spinach and shallots. . .
7. Spoon heavenly mixture onto three large portobella mushroom caps, underside up. 8. Grate a little fresh gruyere cheese and add on top of mushrooms. 9. Bake at 375 oven for about 15-20 minutes until golden brown and mushrooms are cooked through. We couldn’t wait that long and split the smallest one which was done the soonest and let the other two cook a bit longer. While they were finishing in the oven, I sauteed some cleaned asparagus and squeezed a little lemon on it. That’s all. This was a satisfyingly simple meal with just two dishes to eat for our Sunday night supper. We knew there was pumpkin spice cake for dessert so it was easy to be satisfied without a salad. A special treat will be to use some Cabot’s whipped cream (I love that stuff but can’t stay away from it) on top of the warmed slices of cake tonight while we watch that new show, “Madam Secretary” featuring Tea Leoni as Secretary of State and the opener for “The Good Wife’s Fall season. Oh, and that’s after we watched the Patriots struggle against Oakland in their first home game this afternoon at Gillette Stadium. Tom Brady missed a couple of touchdown tries and they only won when an Oakland touchdown was disqualified at the very last minute. P.S. I learned that choosing smallish large mushrooms works better because they cook more quickly than the really thick ones–and the proportion of the stuffing to a thinner mushroom works well. Although it’s a little more effort, toasting freshly made bread crumbs ensures a texture for the crumb dressing that can’t be had from using off the shelf panko or other prepared breadcrumbs. 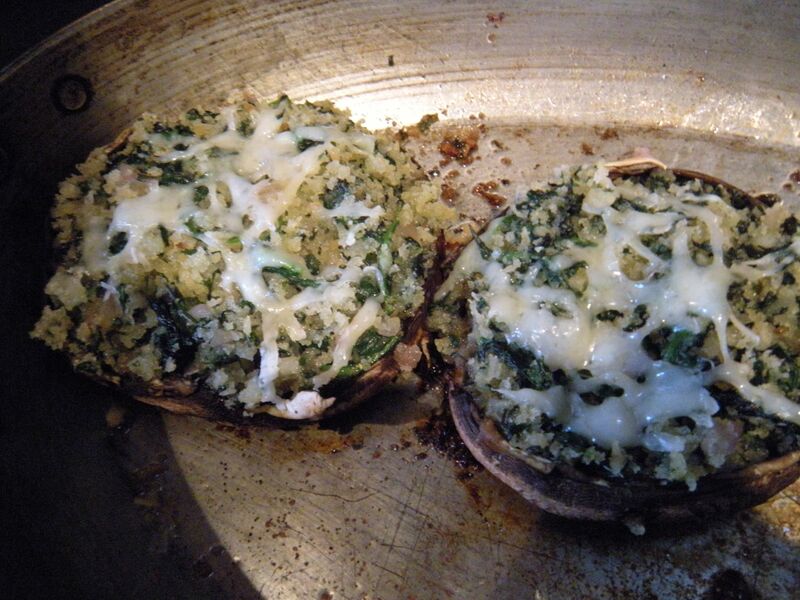 Coarse, buttery, garlicky warm crumbs with fresh chopped spinach (not frozen) makes for delectable eating! This dish was so satisfying that I’m thinking of making it as an accompaniment for our Christmas Eve dinner! Actually, it’s gotten me thinking about learning how to poach a salmon in court bouillon to go along with it! Postscript a week later: I made these again today and had some modifications to offer up. I selected today’s portobella mushrooms from an open bin at the market. I chose smaller, less thick ones (as noted above) because they would require less baking time in the oven. I used my largest copper au gratin pan to brown the bottoms and six of them barely fit. I then placed them in a cold oven to rest while I made the stuffing. When I pulled them out, they had shrunk to at least half their size! So, I removed them to my medium size au gratin pan where they fit snugly with spinach dressing and gruyere cheese on top. I also microplaned the gruyere although the cheese was soft from sitting out and clumped up. No matter, I spread the cheese on top and put a clean dishcloth over it to rest until sliding them under a hot broiler. I don’t think the mushrooms will require baking as such, just browning the tops and heating them up a little under the broiler will do nicely. My daughter, C. is coming for lunch to see the new soapstone countertop today and we’ll have the stuffed mushrooms and a salad of field greens, endive, mandarin oranges, craisins and glazed walnuts with a simple vinaigrette. Next time, I’ll go back to selecting way big portobella mushrooms and just cook them a little longer in the first step. Live and learn, I guess.